Variable brain-specific mutations have been observed in Alzheimer’s disease. One mechanism underlying this mosaicism involves integration of variant gene copies back into the neuronal genome. Guoliang Chai is in the Department of Neurosciences, Howard Hughes Medical Institute, University of California, San Diego, La Jolla, California 92093, USA, and at the Rady Children’s Institute for Genomic Medicine, Rady Children’s Hospital, San Diego. Joseph G. Gleeson is in the Department of Neurosciences, Howard Hughes Medical Institute, University of California, San Diego, La Jolla, California 92093, USA, and at the Rady Children’s Institute for Genomic Medicine, Rady Children’s Hospital, San Diego. Genetic mutations can arise not only in fertilized eggs, affecting all cells of an organism, but also in a subset of an organism’s cells1,2,3. The latter phenomenon, called mosaicism, is prevalent in the brain, and has been associated with several neurological disorders, including sporadic Alzheimer’s disease, the most common form of the disease1,3,4. In 2015, it was found5 that neurons from people with sporadic Alzheimer’s contained more DNA and had more copies of the Alzheimer-related gene amyloid-β precursor protein (APP) than did neurons from people without the disease. However, the exact genomic changes underlying this mosaicism remained unresolved. Writing in Nature, Lee et al.6 follow up on that work, providing a mechanism for increased APP mosaicism in the brains of people with sporadic Alzheimer’s disease. The study could alter our understanding of the roots of neurodegeneration. First, Lee et al. set out to analyse APP variants in neuronal messenger RNA. In each experiment, the authors used mRNA from just 50 neurons from the brains of people with or without sporadic Alzheimer’s, because averaging across large neuronal populations could mask variants present in only a few cells. The researchers’ analysis revealed many APP mRNA variants. 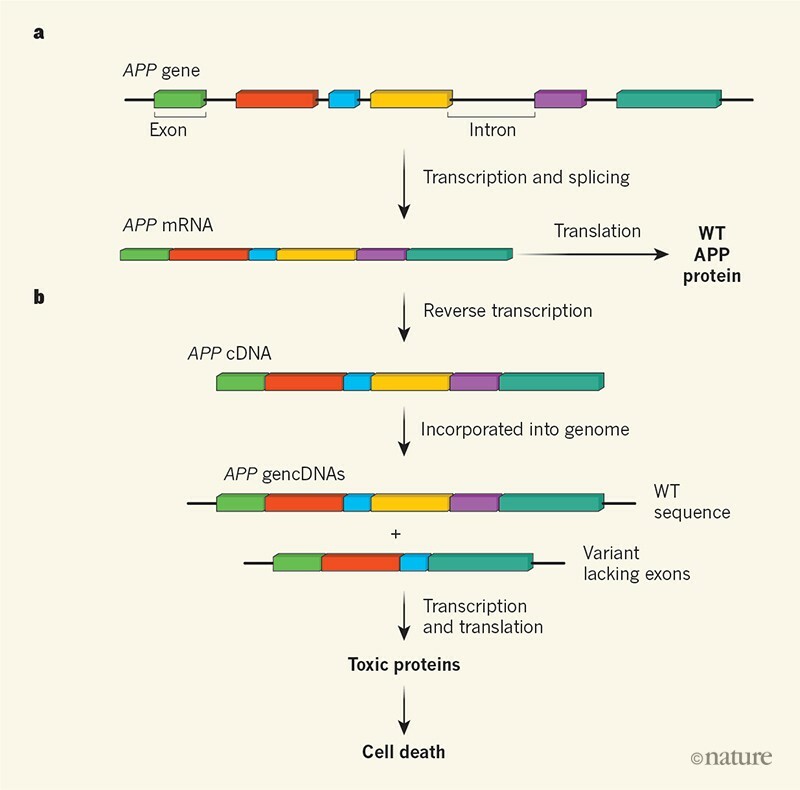 As expected, the variants lacked introns — non-protein-coding regions that are removed during gene transcription through a process called splicing, leaving only protein-coding exons. However, the variants were shorter than expected, and contained single-nucleotide mutations, inserted and deleted exons, and larger deletions that led to the formation of new exon–exon junctions between missing multi-exon regions. Some of the mutations the authors observed have been previously implicated in familial Alzheimer’s disease7. Lee and colleagues found the same short variants when they analysed genomic DNA from the neurons, suggesting that APP-variant mRNAs might be transcribed from matching genomic DNA sequences — named genomic complementary DNAs (gencDNAs) by the authors — that had become permanently embedded in the genomes of neurons. 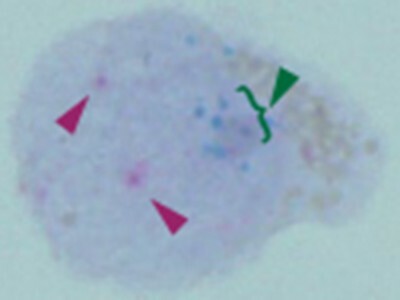 To further validate the existence of APP gencDNAs in neurons, the authors used two independent approaches: a technique called DNA in situ hybridization (DISH), in which fluorescent molecules were bound to gencDNA-specific exon–exon junctions in DNA; and sequencing of short sections of APP DNA. Both approaches confirmed the existence of gencDNA variants. The researchers next investigated the extent of gencDNA diversity using DNA sequencing. In total, they identified 6,299 different APP gencDNA variants in 96,424 neurons from the brains of 5 people with sporadic Alzheimer’s — approximately 10 times more than they found in the brains of people without the disease. In agreement, DISH also revealed substantially more gencDNAs in Alzheimer’s neurons. The authors demonstrated that APP gencDNAs were present in the neurons of a mouse model of Alzheimer’s disease, but rarely in non-neuronal cells or neurons from control animals. Moreover, gencDNA variants accumulated with age. These findings are consistent with a role for APP gencDNA variants in the development of Alzheimer’s. Indeed, the authors found that some APP mRNA variants are translated into proteins that are toxic to cells, further strengthening this possibility. Finally, Lee and co-workers showed that gencDNAs could be generated in cells in culture, provided that two conditions were met. First, the cells’ DNA had to contain breaks in its strands, and, second, the enzyme reverse transcriptase had to be active. This enzyme is responsible for a process called reverse transcription, in which matching DNA sequences are produced from mRNA. The data indicate that gencDNAs arise from reverse-transcribed mRNA intermediates, which are incorporated into the genome in a process that might be promoted by breaks in DNA (Fig. 1). In support of this idea, the authors detected reverse transcriptase activity in the human brain samples, and a previous study has shown the presence of DNA breaks in developing brains8, whereas this phenomenon is rarely observed in other tissue types. Figure 1 | Mosaic incorporation of APP variants into the neuronal genome. a, The gene amyloid-β precursor protein (APP) contains protein-coding exons (coloured blocks) and non-coding introns (this simplified schematic of the gene does not reflect the actual exon–intron composition). During transcription, introns are removed through a process called splicing to produce messenger RNA, which is translated to form the wild-type (WT) protein. b, Lee and colleagues6 found that, in neurons in the human brain, APP mRNA undergoes a process called reverse transcription to produce a complementary DNA (cDNA). The cDNA can be reintegrated into the neuronal genome as a genomic cDNA (gencDNA). At some point in the process, mutations arise — perhaps when the cDNA is integrated into the genome, or at an earlier stage (not shown). This results in a range of gencDNA APP variants, some lacking one or more exons. Some gencDNA variants give rise to toxic proteins, leading to cell death. These processes might contribute to sporadic Alzheimer’s disease. The incorporation of gencDNAs into the genome might share some mechanisms with retrotransposition — a process in which RNA transcribed from DNA sequences called transposable elements can reintegrate into new genomic regions to generate mosaicism3. But how gencDNAs become mutated from the original APP sequence remains unknown. Perhaps the mutations arise from mis-splicing of mRNA, or during genomic integration of gencDNAs. Taken together, Lee and colleagues’ work reveals the surprising existence of a phenomenon known as somatic gene recombination in the brain. This phenomenon, which has previously been reported only in antibody generation in immune cells9, increases the diversity of proteins encoded by a given gene through DNA-shuffling mechanisms. The study hints at a previously unanticipated mechanism in the development of Alzheimer’s, and expands our understanding of the genesis of brain mosaicism. But whether accumulation of gencDNAs in neurons is a cause of or is caused by Alzheimer’s disease remains to be proved. The techniques used here could be applied to investigate whether gencDNA mechanisms are at work in other genes in other tissues; this could provide insights into diseases such as cancer or other degenerative disorders. However, it remains possible that gencDNA production is specific to APP or to neurons. The authors did not find gencDNA variants in another gene involved in Alzheimer’s, presenilin, but nor did they rule out the possibility that gencDNAs could arise from other genes. Neurons have many features that might make them particularly vulnerable to gencDNAs: they are long-lived, have mostly stopped dividing, and have higher levels of reverse transcriptase activity and DNA-strand breaks than do non-neuronal cells8. It is also unclear whether the integration of APP gencDNAs into DNA is random or is biased towards certain genomic regions. The development of more-powerful sequencing techniques should help to answer this question. Of course, there are many other avenues for further research. For instance, whether gencDNAs co-opt the retrotransposition and integration pathways used by transposable elements remains to be tested. The fact that gencDNAs are found in normal neurons suggests that they could have some benefits — this possibility should be examined. Finally, it will be interesting to test whether inhibitors of reverse transcriptase can prevent the accumulation of gencDNAs. Only when these avenues have been explored will we be able to build a complete picture of the remarkable phenomenon observed by Lee and colleagues. Biesecker, L. G. & Spinner, N. B. Nature Rev. Genet. 14, 307–320 (2013). Freed, D., Stevens, E. L. & Pevsner, J. Genes 5, 1064–1094 (2014). Richardson, S. R., Morell, S. & Faulkner, G. J. Annu. Rev. Genet. 48, 1–27 (2014). Beck, J. A. et al. Hum. Mol. Genet. 13, 1219–1224 (2004). Bushman, D. M. et al. eLife 4, e05116 (2015). Lee, M.-H. et al. Nature https://doi.org/10.1038/s41586-018-0718-6 (2018). Murrell, J., Farlow, M., Ghetti, B. & Benson, M. D. Science 254, 97–99 (1991). Blaschke, A. J., Staley, K. & Chun, J. Development 122, 1165–1174 (1996). Tonegawa, S. Nature 302, 575–581 (1983).